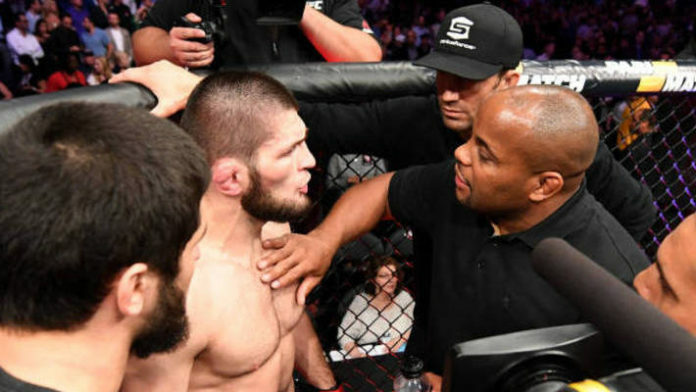 Daniel Cormier recalls when he and Khabib Nurmagomedov had a conversation during the UFC 229 brawl. Nurmagomedov successfully retained his UFC lightweight title against Conor McGregor earlier this month via fourth-round submission. What has most fight fans buzzing is the brawl that took place afterwards. Nurmagomedov jumped into the crowd and went after McGregor’s training partner Dillon Danis. This started a melee and some of “The Eagle’s” teammates brawled with McGregor inside the Octagon. Cormier and Nurmagomedov are teammates at American Kickboxing Academy (AKA). Cormier and fellow heavyweight Cain Velasquez have been looked at as mentors at AKA and Nurmagomedov has become a close friend of “DC.” When Cormier asked “The Eagle” why he did what he did, the lightweight champion responded, “Brother, I don’t know. I lose my mind.” Nurmagomedov will await a punishment from the Nevada State Athletic Commission as will McGregor. Looking back, was the UFC 229 post-fight brawl overblown?